The most successful consultants develop resources, offer advice and educate clients. Email marketing helps you do it better. Establish your expertise in the field with intelligent email newsletters. Remind clients of your services with topical information on current events. Develop solid customer relationships with sophisticated feedback tools. Analyze your success with easy to use tracking features. Email Marketing is a powerful tool that delivers professional email newsletters, announcements and e-bulletins to your clients. Online Survey integration improves the effectiveness of your message by providing comprehensive insight to your clients' preferences. A simple and easy to use Drag and Drop interface makes it easy to create professional content-rich messages in just a few minutes. Add visuals from our library or use your own. Dedicated Email Servers give you the option of having full control of your email reputation. Perfect for consultants sending more than 100,000 emails. 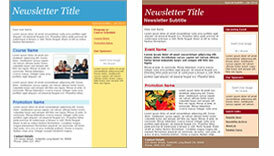 There are over 300 professionally designed templates that suit every aspect of business communication. Customize the look that fits your message and raise your profile in the industry. Benchmark Email can automate your marketing campaign for you, giving you more time to do what you do best, which is successfully run your consulting business!